Some of the tastiest evenings of my childhood start with my Dad at the stove filling the house with the smell of of browning onions and spices. This was always a dead giveaway that we were having company for dinner. Rice in itself was somewhat of a special treat – usually we ate whole wheat flatbread called roti for dinner – and then compound that with my Dad making it meant something delicious was about to happen. When he made rice for a dinner party, he always sautéed whole Indian spices and onion first which just filled the house with an incredible aroma. When my mother wanted to take rice to the next level, she typically added a slew of veggies and a handful of nuts for crunch. I borrowed both tricks to gussy up humble rice in developing this recipe. Of course, I traded basmati for cauliflower rice which works so beautifully with Indian flavors as is evidenced by my recent Berry Pulao recipe. If you haven’t tried that one yet, don’t wait. It is the stuff that inspires dreams of dinner and crazy cravings. But I digress. 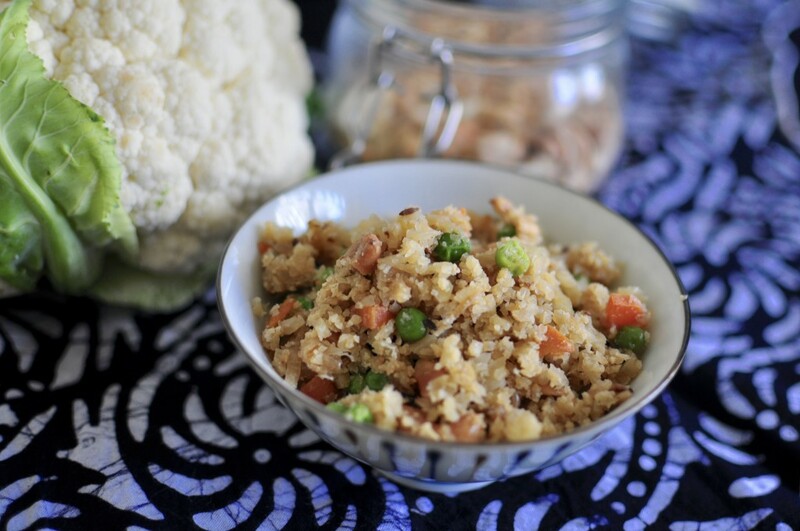 For this recipe, I wanted a fancier version of basic cauliflower rice that tasted good on its own but also could go with any curry that you’ve got going on. I roasted spices and onions to start and then added carrots and peas for color and flavor. I love mixing tart-sweet dried fruit with salty flavors so I added barberries (cranberries would be a fine substitute) and roasted cashews. The resulting dish had gentle spice and plenty of texture with the chewy berries, crunchy nuts, and tender veggies. It also reheated beautifully. And it would be smashing topped with a fried egg, your favorite curry, or eaten by itself cold from the fridge. This one has versatility by the droves. One ingredient note – I recommend ricing your own cauliflower. I have not had good experience using the already riced cauliflower at Trader Joe’s I have tried the frozen and refrigerated version and they both have a funky aftertaste. Very disappointing! An earthy pilau that subs in cauliflower for the rice. This dish brims with textural interest and subtle spice. Pulse half of the cauliflower florets in your food processor until they resemble grains of rice. It should take about 15 one second pulses. After you have done the first half, repeat with the remaining florets. Don't try and do them all at the same time as overcrowding will lead to pieces that are not uniformly sized. Heat your cooking fat in a large skillet over medium heat. Add all the whole spices and bay leaves and sauté for 2 minutes until they all release their aromas. Add the onion into the pot and cook until softened - about 5 minutes. Add the carrots and cook for another 3-4 minutes. Add the riced cauliflower, water, berries and salt to the pan. Give everything a good stir and then cover and cook for 5-7 minutes. You want the cauliflower pieces to go a bit translucent and get tender. Add the cashews into the mix and taste for seasoning. Serve hot. Enter your email address to subscribe and receive new posts directly in your inbox.